Get the same amount of protection as the men do in their work footwear but with a more feminine touch with the TiTAN Oxford Alloy Safety Toe from Timberland PRO. Style number: 63189214. Premium full grain leather upper. 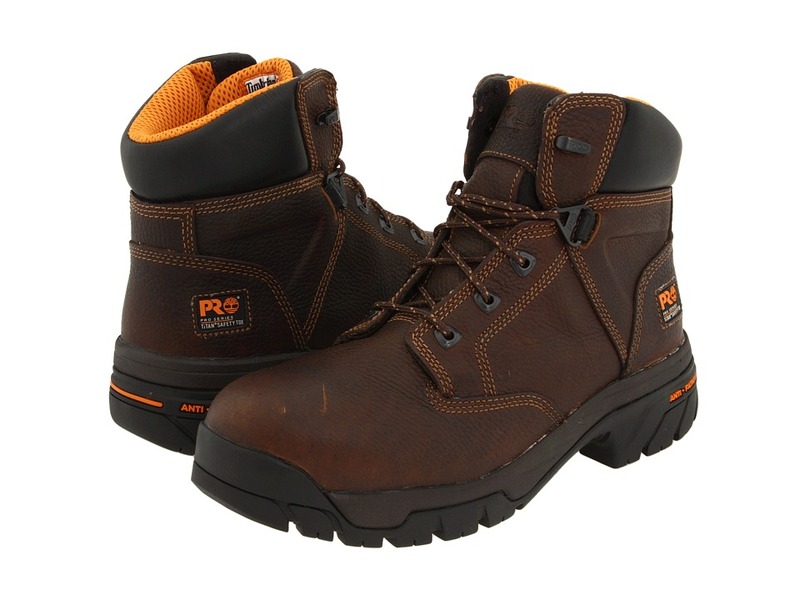 Features the lightest work shoes packed with features for the jobsite including Timberland PROs TiTAN technology. Constructed on a women~s last for superior fit. Cement construction for flexibility and reduced break-in time. Padded collar with a leather heel pull tab. Mesh comfort lining with integral antimicrobial treatment for odor control and drier feet. Contoured open-cell PU footbed with Outlast Adaptive Comfort cover to regulate temperature and provides breathable comfort. Nylon diffusion shank for torsional rigidity. Timberland PRO rubber outsole is abrasion-, slip- and oil-resistant. TiTAN alloy safety toe meets I/75 and C/75 impact and compression, ASTM F2412-11, ASTM F2413-11 and ASTM F2892-11 EH safety standards, providing secondary underfoot protection against the hazards of stepping on live electrical circuits, electrically energized conductors, parts, or apparatus. Imported. Measurements: Heel Height: 1 1 2 in Weight: 1 lb 4 oz Product measurements were taken using size 7, width D - Wide. Please note that measurements may vary by size. Weight of footwear is based on single item, not the pair. Don~t endure another uncomfortable day on the jobsite without a pair of these Timberland PRO Endurance PR Waterproof Steel Toe work boots. Style numbers: 47592001 (Black) and 47591214 (Brown). Features 6 work boots engineered specifically for those who spend long hours working on their feet. The Timberland PRO Endurance series with built-in Anti-Fatigue Technology absorbs shock and returns energy at key zones of the foot to deliver long-lasting, all-day comfort. Waterproof full-grain leather with waterproof membrane to keep your feet dry. Foam-padded collar and tongue with nylon heel pull loop. Unique finger-grip pull-on feature for ease of entry. Dual-purpose top hardware. Mesh lining with Agion anti-microbial treatment. Contoured single-density OrthoLite footbed. Abrasion-resistant rubber double toe at toe box for increased wear protection. Timberland PRO rubber backstay. Anti-fatigue conical PU midsole geometry with fiberglass shank. Cement construction. Flexible Steel-Flex puncture-resistant plate. Meets CSA Grade 1 ESR requirement. Steel toe meets I/75 and C/75 impact and compression ASTM F2412-11 and F2413-11 safety standards. Meets ASTM F2412-11, ASTM F2413-11, and ASTM F2892-11 electrical hazard standards to provide secondary underfoot protection against the hazards of stepping on live electrical circuits, electrically energized conductors, parts, or apparatus. 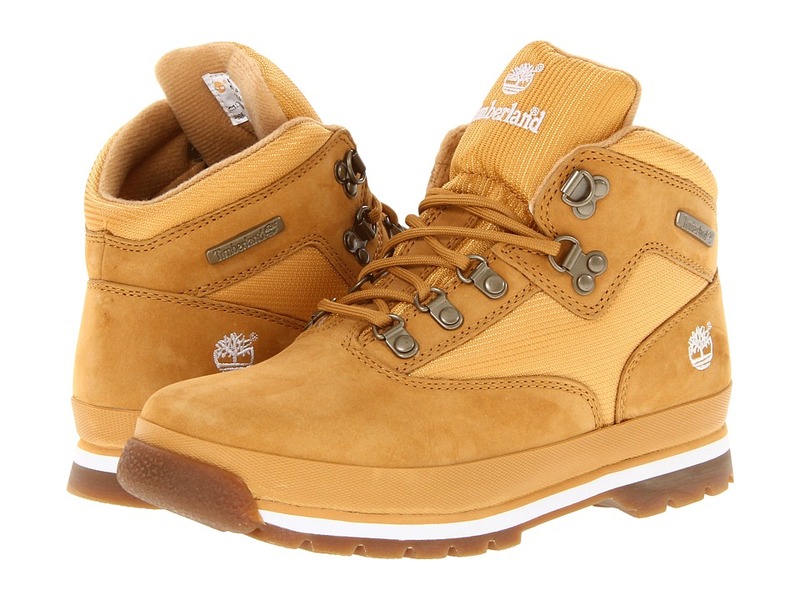 Timberland PRO rubber outsole is slip/heat/oil and abrasion-resistant with Ladder Lock radius. Imported. Measurements: Weight: 2 lbs 7 oz Circumference: 13 1 2 in Shaft: 5 in Product measurements were taken using size 9, width D - Medium. Please note that measurements may vary by size. Weight of footwear is based on single item, not the pair. No longer will you have to jump through hoops just to get a pair of dependable women~s work shoes. 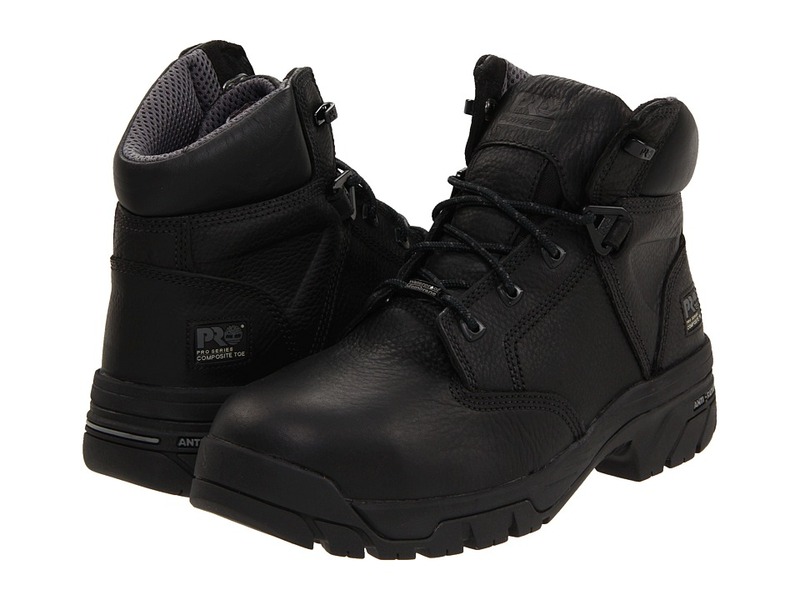 The Rigmaster 8 Waterproof Alloy Safety Toe work boot from Timberland PRO is all you~ll ever need. Style number: 88116214. Features 8 work boots engineered specifically to provide workers in the oil and gas industries and designed to fit a woman~s foot. 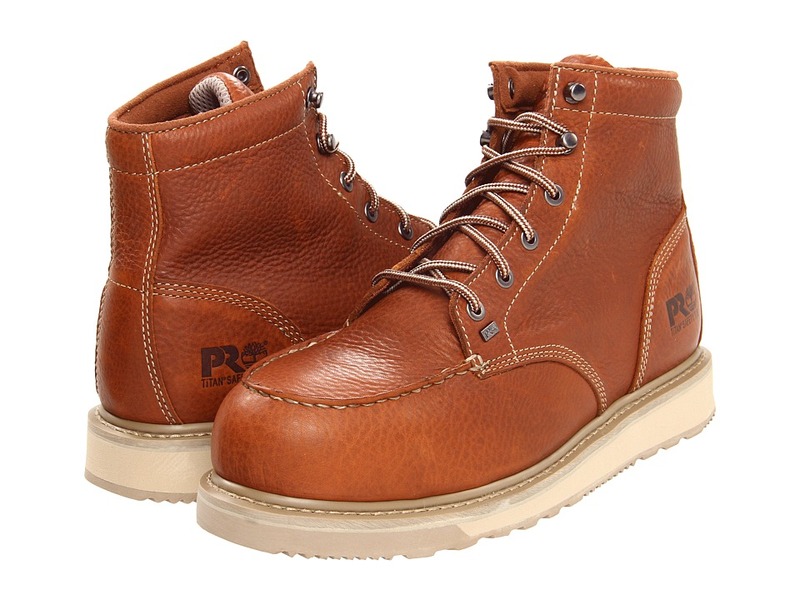 Waterproof full grain leather upper with waterproof membrane to keep out the wet elements. Anti-Fatigue Technology absorbs shock and returns energy at key zones of the foot for comfort. Features molded, inverted cones support, collapse and return energy in key pressure zones, and the cone structure uses less material for a lighter boot. Contrast stitched details. Heavy-duty laces with metallic eyelets. Mesh lining with Agion anti-microbial treatment. Contoured single-density open-cell polyurethane footbed for excellent underfoot comfort. Fiberglass shank for added support. Aggressive tread design features triangular lock lugs that provide maximum traction. Features Ladder Lock outsole radius. Goodyear Welt Cast-Bond construction for a durable chemical and mechanical bond. Timberland PRO rubber outsole uses a heat-resistant, durable, specially-made rubber compound to offer improved resistance to slipping, oil and abrasions - resulting in better traction on all surfaces. TITAN alloy safety toe meets Meets I/75 and C/75 impact and compression, and meets ASTM F2412-11, ASTM F2413-11 and ASTM F2892-11 EH electrical hazard standards, providing secondary underfoot protection against the hazards of stepping on live electrical circuits, electrically energized conductors, parts, or apparatus. Imported. Measurements: Weight: 2 lbs 13 oz Shaft: 8 in Product measurements were taken using size 10, width D - Wide. Please note that measurements may vary by size. Weight of footwear is based on single item, not the pair. Whether you travel around the world or just across town, the Euro Hiker never lets you down. Soft leather and textile upper delivers durability. Lace-up closure with D-ring lacing system for a snug fit. Fabric lining with extra padding at the tongue and collar offers comfort where it counts. Toe-guard for added protection. EVA midsole and textured rubber outsole provides excellent traction. Measurements: Heel Height: 1 in Weight: 13 oz Shaft: 5 in Product measurements were taken using size 5.5 Big Kid, width M. Please note that measurements may vary by size. Weight of footwear is based on a single item, not a pair. 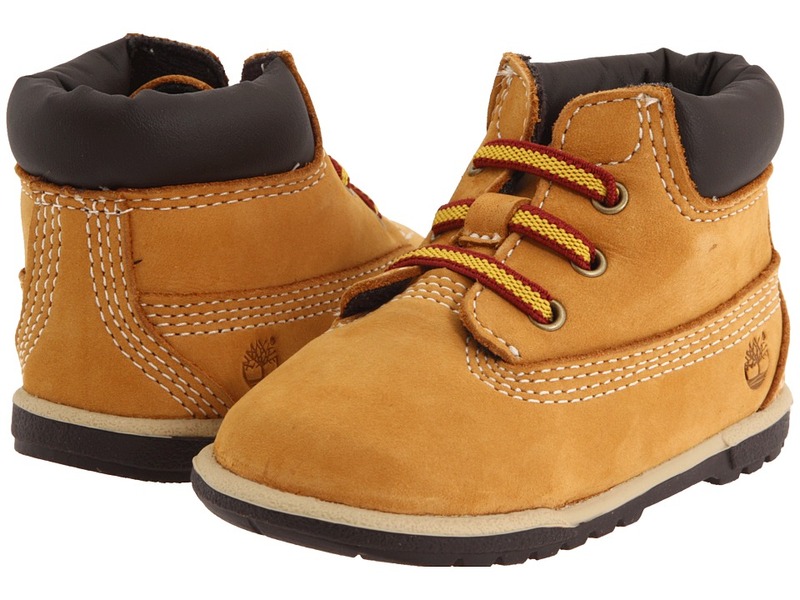 The 6 Crib Bootie brings the entire family into Timberland style. Extra soft premium nubuck leather adds durability. Stretch elastic laces for easy on and off. Padded collar offers comfort where it counts. Brushed nylon lining and footbed cover keep feet fresh. EVA footbed absorbs shock. Flexible rubber outsole provides traction. Measurements: Weight: 3 oz Product measurements were taken using size 3 Infant, width M. Please note that measurements may vary by size. Weight of footwear is based on a single item, not a pair. 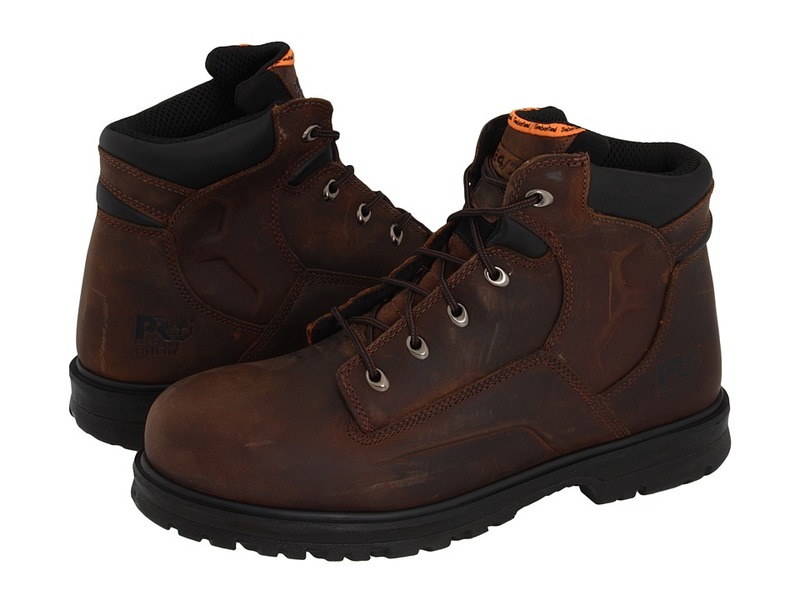 Stay comfortable and protected in the Magnus 6 Steel Toe work boot from Timberland PRO. Style number: 85591214 Distressed oiled nubuck leather upper. Goodyear Welt Cast-Bond construction for a durable and mechanical bond. Lightweight and constructed on TiTAN last for a superior fit. Comfort-engineered with contoured tongue designed to relieve lace pressure. Cambrelle&amp#174 fabric lining with antimicrobial treatment for odor control. Contoured single-density open-cell polyurethane footbed provides excellent breathability, underfoot comfort, and support. Steel shank. Steel toe meets I/75 and C/75 impact and compression ASTM F2412-11 and F2413-11 safety standards. Meets ASTM F2412-11, ASTM F2413-11 and ASTM F2892-11 electrical hazard standards to provide secondary underfoot protection against the hazards of stepping on live electrical circuits, electrically energized conductors, parts, or apparatus. Single-density polyurethane outsole with an aggressive tread design offers superior traction and features Ladder Lock outsole radius. Imported. Measurements: Weight: 1 lb 14 oz Circumference: 14 in Shaft: 6 in Product measurements were taken using size 11, width D - Medium. Please note that measurements may vary by size. Weight of footwear is based on a single item, not a pair. 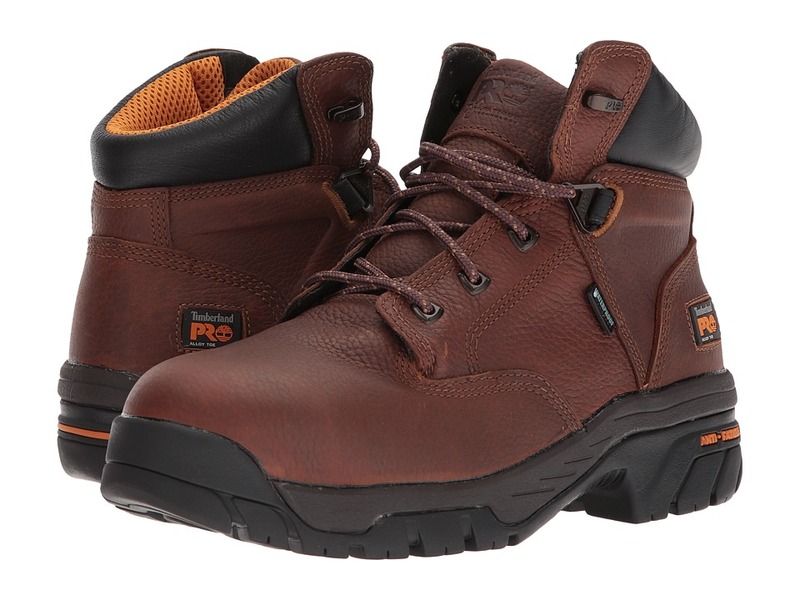 Protect yourself in the workplace with the reliable Helix 6 Waterproof Safety Toe by Timberland PRO&amp#174. 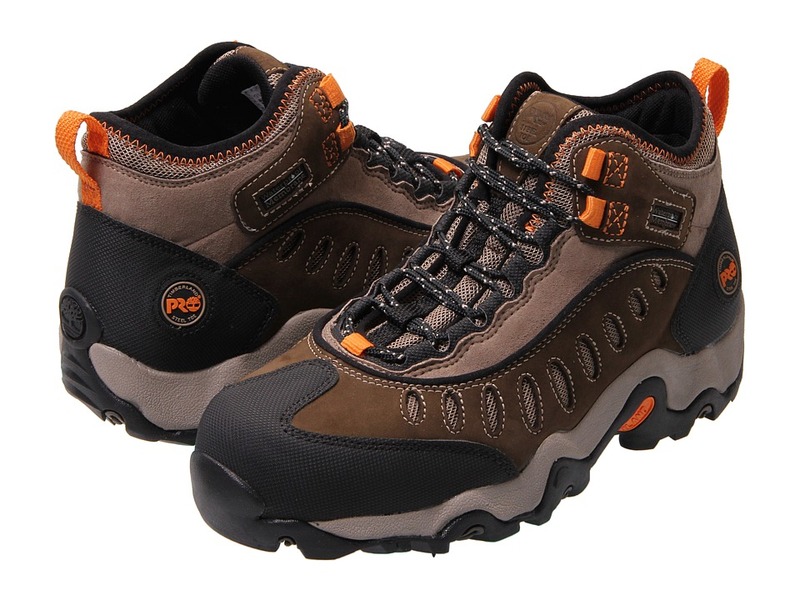 Style number: 85594214 Rugged full-grain waterproof leather upper. Mesh lining with Agion&amp#174 anti-microbial treatment. Active heel lock lacing system. Contoured single-density open-cell PU footbed. Dual-purpose top hardware. Anti-Fatigue Technology with conical midsole geometry. Padded collar and tongue. Cement construction. Side logo detail. TiTAN&amp#174 alloy safety toe cap for lightweight protection. Alloy safety toe meets I/75 and C/75 impact and compression ASTM F2412-11 and ASTM F2413-11 safety standards. Meets ASTM F2412-11, ASTM F2413-11 and ASTM F2892-11 electrical hazard standards to provide secondary underfoot protection against the hazards of stepping on live electrical circuits, electrically energized conductors, parts, or apparatus. Timberland PRO&amp#174 rubber outsole offers slip, oil and abrasion resistance. It also features Ladder Lock&amp#174 outsole radius. Imported. Measurements: Weight: 1 lb 13 oz Circumference: 13 3 4 in Shaft: 5 in Product measurements were taken using size 9.5, width D - Medium. Please note that measurements may vary by size. Weight of footwear is based on a single item, not a pair. 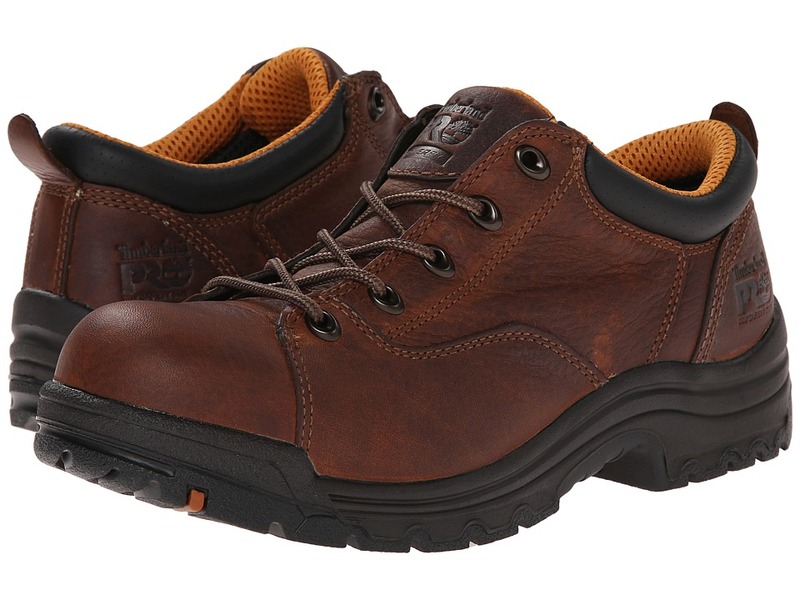 You~ll be glad you chose the Gladstone Steel Toe work shoe by Timberland PRO&amp#174! Style number: 86509214 Premium full grain leather upper. Leather-lined and padded top collar for added comfort. Cement construction for flexibility and reduced break-in time. Microfiber lining with antimicrobial treatment for odor control. Cushioned footbed with Dynamic Anti-Fatigue Technology that absorbs shock and returns energy back to the foot. Non-metallic fiberglass shank. Conductive rubber and PU midsole inserts for consistent static dissipative performance. Steel toe meets I/75 and C/75 impact and compression ASTM F2412-11 and F2413-11 safety standards. Meets SD static-dissipative ASTM F2412-11, ASTM F2413-11 and ASTM F2892-11 safety standards. They provide protection through conduction and resistance to the wearer against potential hazards due to excessively low footwear resistance. Non-marking Goodyear&amp#174 rubber outsole has a low-profile tread pattern and is slip resistant. Goodyear SafeGrip&amp#8482 slip-resistant rubber sole offers grip on wet and dry surfaces. Imported. Measurements: Weight: 1 lb 8 oz Product measurements were taken using size 11, width EE - Wide. Please note that measurements may vary by size. Weight of footwear is based on a single item, not a pair. Playing in the mud as a kid was a dream come true, and now that you~re all grown up, you can enjoy your dream job to its full potential with the Mudslinger boot! 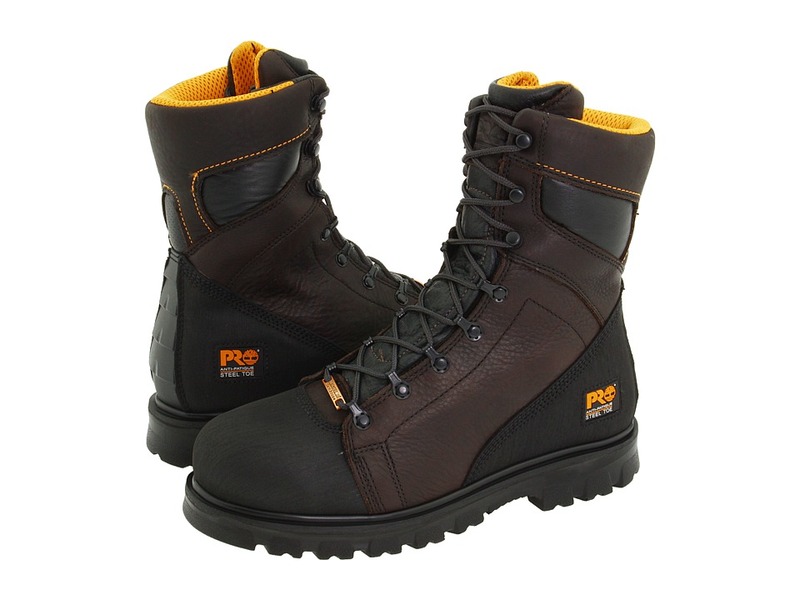 Style number: 86515214 Waterproof leather upper with waterproof membrane. Nylon and leather ghillie lacing system for a secure fit. Cement construction for flexibility and reduced break-in time. Mesh lining with Agion&amp#174 anti-microbial treatment. Single-density open-cell PU footbed for underfoot comfort. Compression molded EVA midsole for lightweight cushioning. Nylon shank for torsional rigidity. Steel toe meets I/75 and C/75 impact and compression ASTM F2412-11 and F2413-11 safety standards. Meets ASTM F2412-11, ASTM F2413-11 and ASTM F2892-11 electrical hazard standards to provide secondary underfoot protection against the hazards of stepping on live electrical circuits, electrically energized conductors, parts, or apparatus. Timberland PRO&amp#174 rubber outsole is slip/oil resistant with low electrical resistance. Imported. Measurements: Weight: 1 lb 5 oz Product measurements were taken using size 9, width D - Medium. Please note that measurements may vary by size. Weight of footwear is based on a single item, not a pair. Complete every workday with the reassuring protection and comfort of the Helix 6 Alloy Toe work boot by Timberland PRO. Style number: 86518214 Waterproof full grain leather upper. 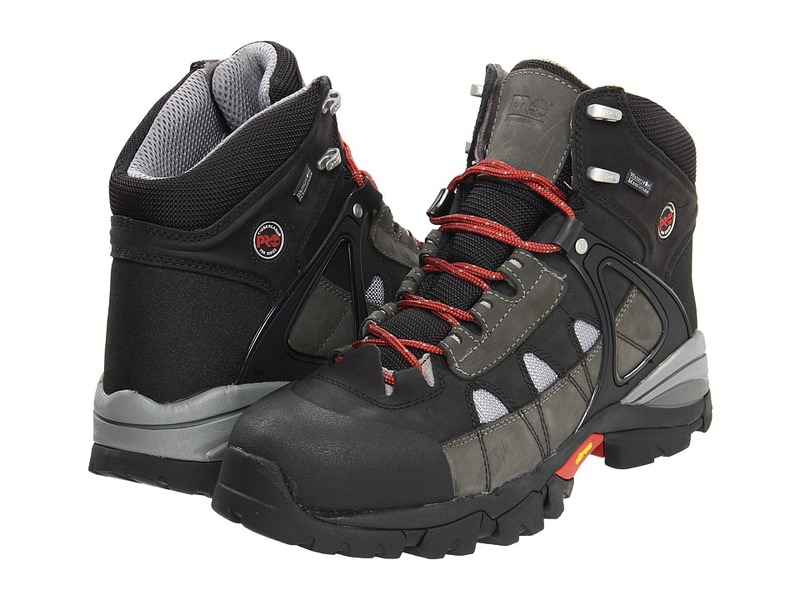 TiTAN alloy safety toe provides lightweight protection and roomier fit. Waterproof membrane keeps out the wet elements for a drier, more comfortable foot environment. Cement construction provides both durability and flexibility to the boot. Breathable mesh lining with antimicrobial treatment for odor control. Active heel lock lacing system offers a more secure fit. Padded tongue and collar for added comfort. Mesh Agion antimicrobial technology lines the footbed, creating a more comfortable, odor-free environment. Contoured single-density open-cell PU footbed with antimicrobial cover for breathable comfort and odor control. Molded EVA midsole with anti-fatigue technology that absorbs shock and returns energy to your foot. Nylon shank for structural support. Alloy safety toe meets I/75 and C/75 impact and compression ASTM F2412-11 and ASTM F2413-11 safety standards. Meets ASTM F2412-11, ASTM F2413-11, and ASTM F2892-11 electrical hazard standards to provide secondary underfoot protection against the hazards of stepping on live electrical circuits, electrically energized conductors, parts, or apparatus. Durable rubber outsole is slip, oil, and abrasion resistant, and features the Ladder Lock outsole radius, offering comfort and stability on extension ladders. Measurements: Weight: 1 lb 12 oz Circumference: 14 1 4 in Shaft: 5 1 2 in Product measurements were taken using size 9, width D - Medium. Please note that measurements may vary by size. Weight of footwear is based on a single item, not a pair. Hear the sweet sigh of relief as you sink your soles into the cushioned comfort of the Newbury ESD Alloy Toe slip on from Timberland PRO. Full grain, polished leather upper. Alloy safety toe offers lightweight protection. Built on a women~s -specific last for enhanced comfort. PowerFit comfort system uses ergonomic elements at key zones to promote enhanced movement and support. Antimicrobial lining promotes a healthier in-shoe environment. Innovative Anti-Fatigue technology absorbs impacting shock, while offering optimal energy return for all-day, standing comfort. Conductive polyurethane ESD footbed provides protection from static buildup or discharge. Fiberglass shank for added stability. Slip-resistant and abrasion-resistant outsole delivers exceptional grip and durability. Alloy toe meets Meets I/75 and C/75 impact and compression standards and SD static-dissipative ASTM F2412-11, ASTM F2413-11 and ASTM F2892-11 safety standards, providing protection through conduction and resistance to the wearer against potential hazards due to excessively low footwear resistance. Imported. Measurements: Weight: 14 oz Product measurements were taken using size 8, width B - Medium. Please note that measurements may vary by size. Weight of footwear is based on a single item, not a pair. Protect yourself from the ground up when you~re on the worksite by slipping into the cushioned, supportive comfort of the Timberland PRO Helix 6 Waterproof Composite Toe boot. Style number: 87517001 Hardy, full-grain waterproof leather upper with a waterproof membrane to ensure optimal protection. PowerFit comfort system uses ergonomic elements at key zones to promote enhanced movement and support. Composite TITAN shaped safety toe offers non-metallic protection and comfort. Dual-purpose top hardware. Active heel lock lacing system promotes a secure, snug fit. Cement construction. Mesh lining with Agion treatment promotes a drier, healthier in-shoe environment. Contoured, open-cell PU footbed for all-day comfort. Innovative Anti-Fatigue technology absorbs impacting shock, while offering optimal energy return for all-day, standing comfort. Molded EVA midsole provides lightweight cushioned comfort. Nylon shank for added support. Composite toe meets I/75 and C/75 impact and compression ASTM F2412-11 and F2413-11 safety standards. Meets ASTM F2412-11, ASTM F2413-11, and ASTM F2892-11 electrical hazard standards to provide secondary underfoot protection against the hazards of stepping on live electrical circuits, electrically energized conductors, parts, or apparatus. Rubber outsole offers exceptional slip resistance, oil resistance, heat resistance and abrasion resistance. Imported. Measurements: Weight: 1 lb 15 oz Circumference: 13 1 2 in Shaft: 5 1 2 in Product measurements were taken using size 9.5, width D - Medium. Please note that measurements may vary by size. Weight of footwear is based on a single item, not a pair. Conduct business from your office with the freedom to check on your guys in the field, in the protective comfort of the Gladstone Steel-Toe from Timberland PRO. Style number: 85590214 Premium full grain leather upper. Steel safety toe offers hardy protection. Plush collar for added comfort. Cement construction for flexibility and reduced break-in time. Microfiber lining with antimicrobial treatment for odor control. Cushioned footbed with Dynamic Anti-Fatigue Technology that absorbs shock and returns energy back to the foot. Conductive rubber and polyurethane midsole inserts for consistent static dissipative performance. Non-metallic fiberglass shank for added support. Steel toe meets I/75 and C/75 impact and compression ASTM F2412-11 and F2413-11 safety standards. Meets SD static-dissipative ASTM F2412-11, ASTM F2413-11 and ASTM F2892-11 safety standards. They provide protection through conduction and resistance to the wearer against potential hazards due to excessively low footwear resistance. Goodyear rubber outsole material delivers exceptional grip and lightweight, yet durable abrasion resistance. Non-marking, slip-resistant SafeGrip rubber sole technology provides optimal traction on both wet and dry surfaces. Imported. Measurements: Weight: 1 lb 8 oz Product measurements were taken using size 10, width D - Medium. Please note that measurements may vary by size. Weight of footwear is based on a single item, not a pair. 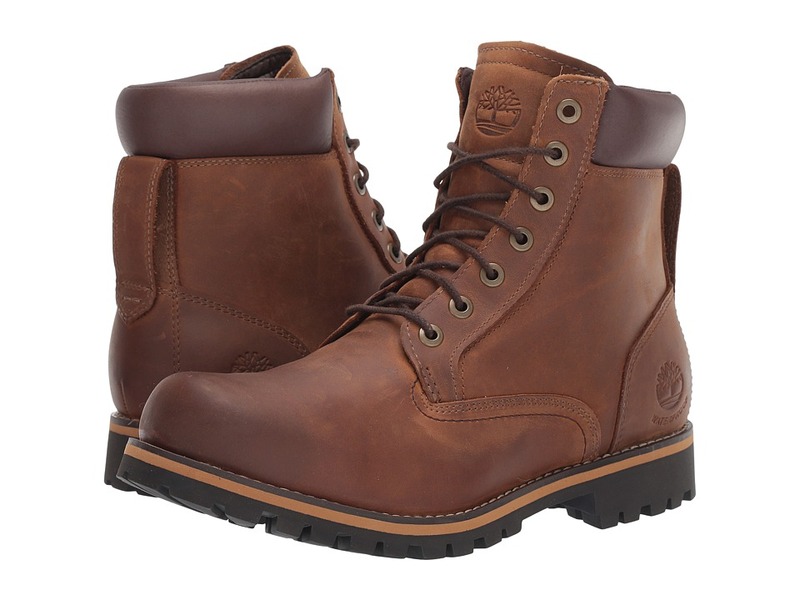 There~s no mistaking the Earthkeepers Rugged 6 Boot from Timberland for anything but the hard-wearing and durable boot that it is! Waterproof seam-sealed construction with premium full grain leather upper is guaranteed to keep feet dry in any weather. 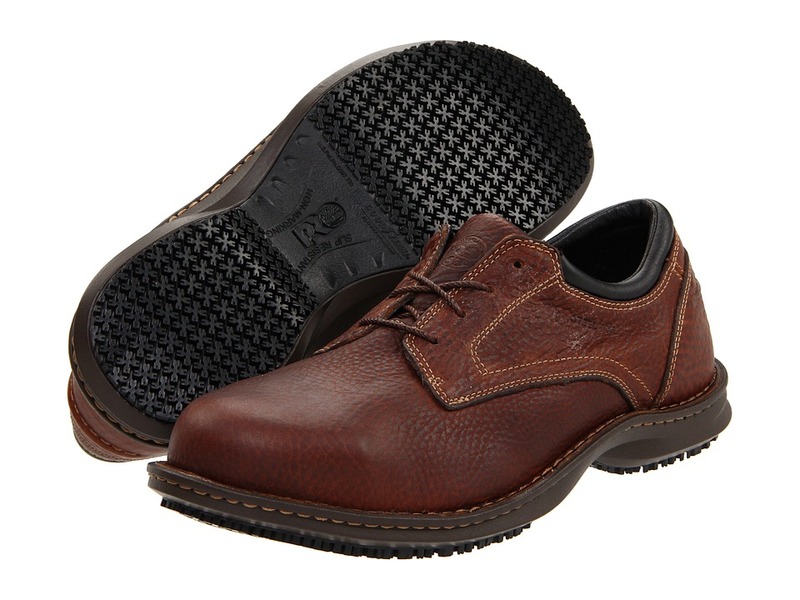 Lace-up closure with fully cushioned collar provides a customized and comfortable fit. 100 percent recycled PET lining offers breathability to maintain a healthy, happy foot environment. Anti-fatigue technology is built into the midsole, using geometric cone support to provide exceptional standing comfort and shock absorption. Green Rubber outsole, made with 42 percent recycled rubber, offers durable grip to guarantee sure footing. Imported. Measurements: Heel Height: 1 1 4 in Weight: 1 lb 10 oz Circumference: 13 1 4 in Shaft: 6 1 4 in Product measurements were taken using size 9.5, width D - Medium. Please note that measurements may vary by size. Weight of footwear is based on a single item, not a pair. Oil riggers are a special breed. It takes someone with cajones to do what they do, and that~s why the Timberland PRO Rigmaster Waterproof Steel-Toe boots were engineered for those who walk on water. Style number: 95553214. Features 8 work boots made specifically for workers in the oil and gas industries with exceptional slip-resistance. 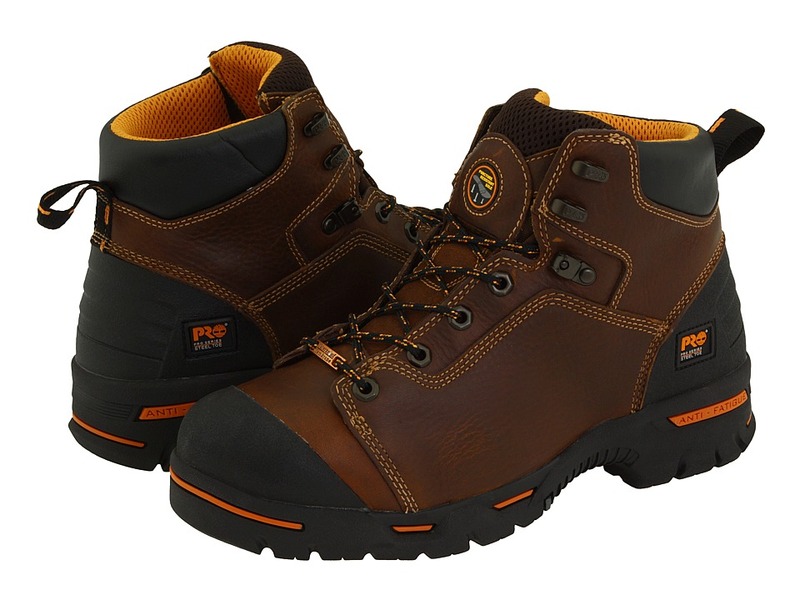 Waterproof full-grain leather upper with waterproof membrane to keep your feet dry. Foam-padded collar and tongue. Unique fingergrip pull-on feature for ease of entry. Mesh lining with Agion antimicrobial treatment. Contoured, single-density OrthoLite footbed. Heavy-duty laces with quick-release hardware for easy on/off. Goodyear Welt Cast-Bond construction for a durable mechanical and chemical bond. Anti-Fatigue technology with conical PU midsole geometry. Steel shank. Single-density PU outsole that~s lightweight yet rugged with exceptional cushioning. Aggressive tread design featuring triangular lock lugs for maximum traction. Ladder Lock outsole radius. Steel toe meets I/75 and C/75 impact and compression ASTM F2412-11 and F2413-11 safety standards. Meets ASTM F2412-11, ASTM F2413-11, and ASTM F2892-11 electrical hazard standards to provide secondary underfoot protection against the hazards of stepping on live electrical circuits, electrically energized conductors, parts, or apparatus. Imported. Measurements: Weight: 2 lbs 3 oz Circumference: 14 in Shaft: 8 1 2 in Product measurements were taken using size 8, width D - Medium. Please note that measurements may vary by size. Weight of footwear is based on a single item, not a pair. The Timberland PRO Hyperion WP XL Safety Toe boot works as hard as you to keep you protected when your working in hazardous environments. 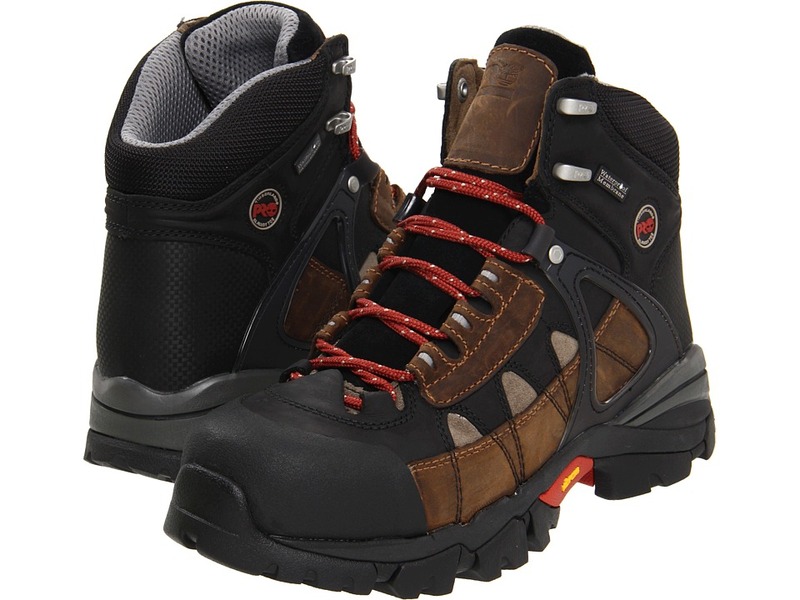 Style number: 90646214 Waterproof leather upper features a waterproof membrane. TPU instep overlays allow for a better fit and support. 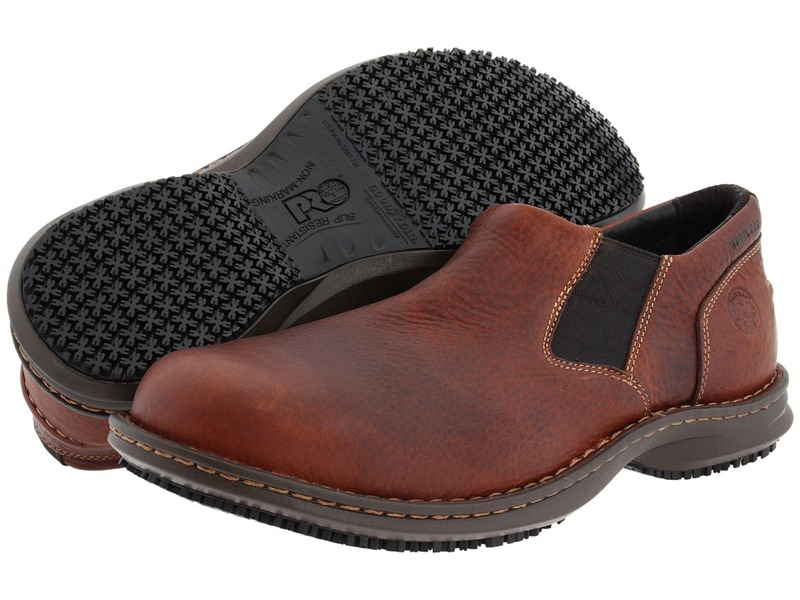 Alloy safety toe cap, shaped on a TiTAN&amp#174 XL last, provides lightweight protection and generous fit. Dual-purpose top hardware for quick lacing. PowerFit comfort system has supportive comfort at key zones. Mesh lining with Agion&amp#174 antimicrobial treatment for improved odor control and a more comfortable foot environment. Cement construction for better flexibility and easier break-in time. Contoured, dual-density footbed with Dynamic Anti-Fatigue Technology absorbs shock and returns energy at key zones of foot while providing enhanced moisture management. Lightweight molded EVA midsole. Durable rubber double toe and Ever-Guard leather backstay for increased protection against abrasions. Fiberglass shank offers excellent structural support. Safety toe meets I/75 and C/75 impact and compression ASTM F2412-11 and F2413-11 safety standards. Meets ASTM F2412-11, ASTM F2413-11 and ASTM F2892-11 electrical hazard standards to provide secondary underfoot protection against the hazards of stepping on live electrical circuits, electrically energized conductors, parts, or apparatus. Durable Vibram rubber outsole is slip, oil, and abrasion resistant, and features the Ladder Lock outsole radius, offering comfort and stability on extension ladders. Measurements: Weight: 1 lb 15 oz Circumference: 14 in Shaft: 6 in Product measurements were taken using size 9, width EE - Wide. Please note that measurements may vary by size. Weight of footwear is based on a single item, not a pair. The Timberland PRO Hyperion WP XL Soft Toe boot offers the perfect rugged construction and cushioned comfort to protect when your working in hazardous environments. 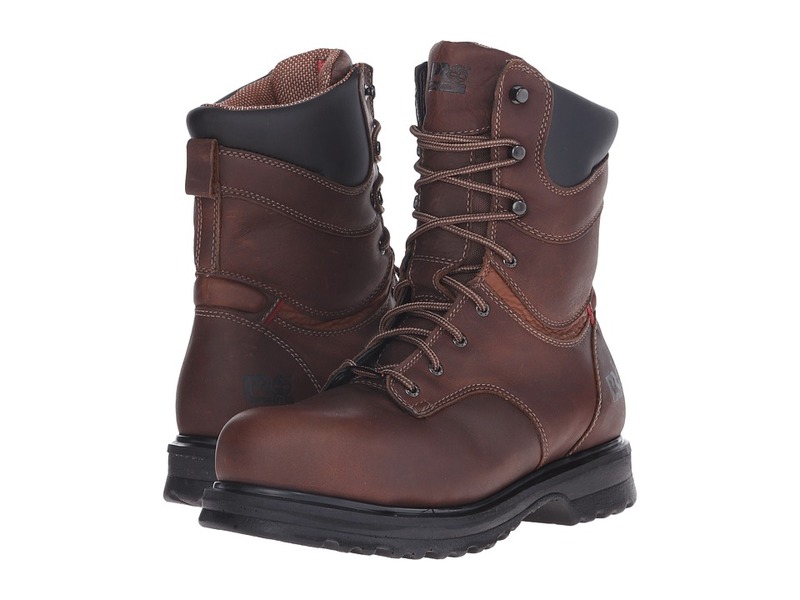 Style number: 90625357 Waterproof leather upper features a waterproof membrane for extreme abrasion resistance and keeping your feet dry in wet conditions. TPU instep overlays allow for a better fit and support. Dual-purpose top hardware for quick lacing and added durability. PowerFit comfort system has supportive comfort at key zones that enhance movement and provide vital support for maximum comfort. Mesh lining with Agion&amp#174 antimicrobial treatment for improved odor control. Cement construction for better flexibility and easier break-in time. Contoured, dual-density footbed with Dynamic Anti-Fatigue Technology absorbs shock and returns energy at key zones of foot while providing enhanced moisture management for all-day comfort. Molded EVA midsole has a lightweight construction for excellent athletic performance. Durable rubber double toe and Ever-Guard leather backstay provides increased protection against abrasions. Fiberglass shank offers excellent structural support. Durable Vibram rubber outsole is slip, oil, and abrasion resistant, and features the Ladder Lock outsole radius. Meets ASTM F2412-11, ASTM F2413-11 and ASTM F2892-11 electrical hazard standards to provide secondary underfoot protection against the hazards of stepping on live electrical circuits, electrically energized conductors, parts, or apparatus. Measurements: Heel Height: 1 1 2 in Weight: 1 lb 15 oz Circumference: 13 in Shaft: 6 in Platform Height: 3 4 in Product measurements were taken using size 11.5, width D - Medium. Please note that measurements may vary by size. Weight of footwear is based on a single item, not a pair. The Barstow Wedge Safety Toe boot by Timberland PRO offers the rugged protection and cushioned comfort required to get through your tough workday. Style number 88559214. Full grain leather upper. Constructed on TiTan last for superior fit. Mesh tongue lining with Agion antimicrobial treatment provides excellent odor control for a more comfortable foot envirnment. Goodyear-welt construction offers long-lasting durability. Dual-density Dynamic Anti-Fatigue Technology absorbs shock and returns energy at key zones of the foot while providing enhanced moisture management for all-day comfort. 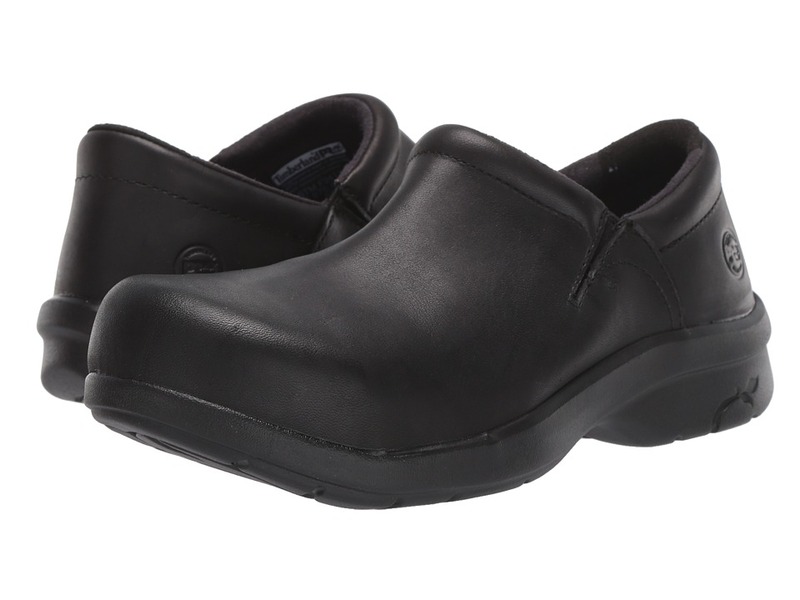 Open-cell PU footbed cover with Agion antimicrobial treatment offers breathable comfort and odor control. Lightweight EVA midsole provides supportive cushioning. Durable rubber outsole is slip, oil, and abrasion resistant. Alloy safety toe protection meets I/75 and C/75 impact and compression and ASTM F2412-11, ASTM F2413-11 and ASTM F2892-11, EH safety standards. Imported. Measurements: Heel Height: 1 1 2 in Weight: 2 lbs Circumference: 13 in Shaft: 6 in Platform Height: 3 4 in Product measurements were taken using size 11.5, width D - Medium. Please note that measurements may vary by size. Weight of footwear is based on a single item, not a pair.